FNV members voted on November 22 to approve a much improved package of employment guarantees and pension arrangements for the more than 300 workers at the former Unilever factory in Oss which was sold to the Zwanenberg Food Group in July. 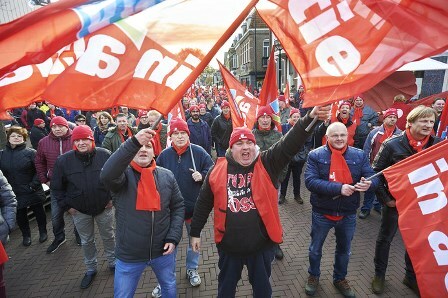 Beginning November 3, the FNV organized repeated work stoppages over twenty days in support of their demands, effectively paralyzing production. Under the terms of the sale, Unilever retains ownership of the brands and recipes - along with responsibility for sales and marketing. Zwanenberg now owns the factory, which produces Unox, Bertolli and Knorr products under license, and employs the workers under a long-term agreement with Unilever. IUF affiliates around the world with members at Unilever sent messages of solidarity to the strikers and the FNV, which has warmly thanked them for the support they received.